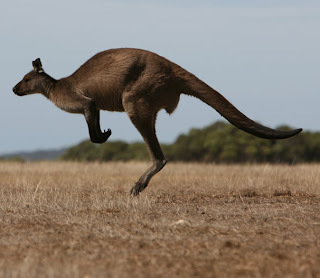 Kangaroo Island, Australia’s third biggest island lies in the south, south-west of Adelaide. The island is 155km in length, and has a population of 4,600. This beautiful island has so many attractions, one of the most desirable qualities being its animal population. More than one-third of the island is Conservation or National Park, meaning there is an abundance of wildlife. Since the island is a safe-haven for native Australian animals, Island-goers could see Kangaroos, Wallabies, Penguins, Koalas, Ospreys, and much, much more. The island is home to all types of Australian landscape. Throughout the island are beautiful cliffs, sand dunes, forests, wetlands, and massive beaches with sugar-white sand. There is such a diverse array of landscapes, which is one of the many reasons why Kangaroo Island is such a hot spot. 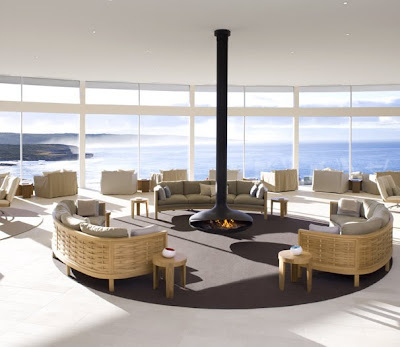 Located on the south west coast of Kangaroo Island is the beautiful and luxurious resort, The Southern Ocean Lodge. 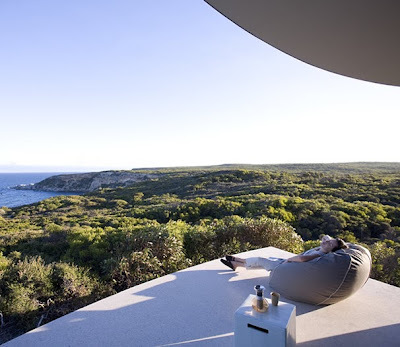 The eco-chic style accommodation is a beautiful destination with full-frontal panoramic views. 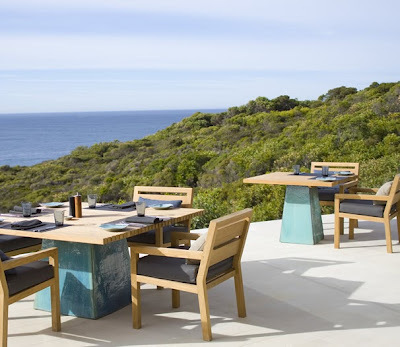 Serving all locally sourced food and beverages, the resort provides a unique luxury experience of Australian culture and wildlife. The glass walled bedrooms provide stunning views of the landscape. The sand blasted limestone floors are unique to the resort, as well as the luxurious spa. The spa is perched high on a cliff with beautifully dramatic views of the Southern Ocean. For more information about the Southern Ocean Lodge, visit www.southernoceanlodge.com.au. What do these three baths have in common? They are all relaxing and luxurious. Take a look at these beautiful and unique bathtubs which take the common bathtub experience to a new level. When you think of a hammock peace and relaxation is what comes to mind, while a bathtub is a place to unwind after a long day. When combined they represent the ultimate escape into serenity and relaxation. This tub, created by Splinter Works, was “inspired to develop a piece that would provide the ultimate vehicle for total escapism”. 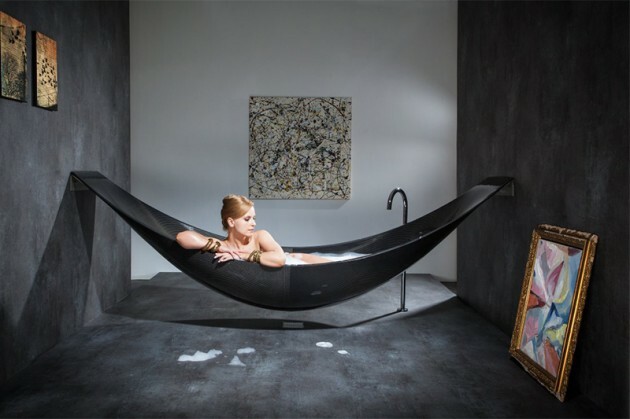 This modern bathtub creates an experience suspended in mid-air, providing a hammock feel and shape. 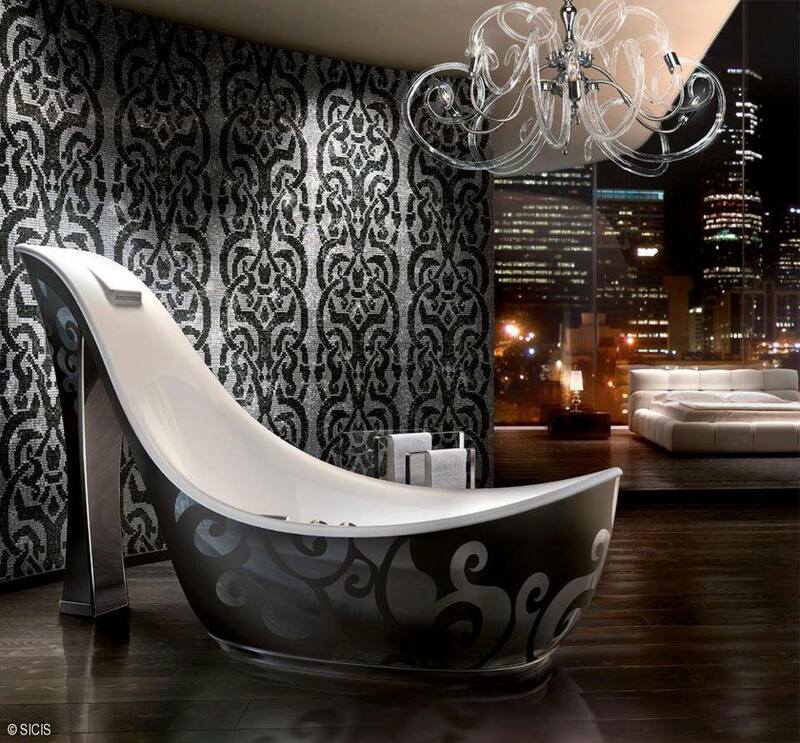 This elegant design takes bathing to a new level of chic. It’s a funky, cool design that makes a standard piece like a bathtub stand out. It’s a fun way to spice up the monotony of a bathroom. And for shoe-lovers everywhere, it’s a dream come true! 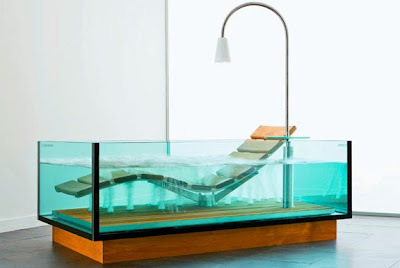 This water lounge is less like a bathtub and more like a beautiful relaxation spot. The tub fills with water, around a bed-like relaxation structure inside it. Jets from underneath the wooden floor of the tub shoot upward and provide a full-body massage. All three of these bathtubs take an ordinary situation and create a spa-like atmosphere. It’s hard not to feel pampered when sinking into the water of one of these tubs. For more information about the Hammock Bath visit www.splinterworks.co.uk. In the Virgin Islands, there is a beautifully luxurious oasis called Necker Island. At 74,000 acres, the island is filled with tropical plants, sandy beaches, and exotic wildlife. Necker is entirely surrounded by coral reef, a long jetty acting as the sole way boats can approach the shores. The Caribbean waters are a luscious turquoise, encircling a resort which occupies the whole island. The private island can only occupy 28 guests at a time. Since there are 60 staff members, the guests are outnumbered. Even so, the staff is hardly seen by guests, as to create the feeling of solitude. Guests are also far outnumbered by the 200 plus flamingos occupying the island. Most rooms in the resort are open air, hardly featuring doors or keys; instead there are nets to prevent unwanted bugs. Every room on the island includes a stunning 360-degree panoramic view of the scenery. The island also features almost any activity you can think of, including sailing, kite surfing, kayaking, tennis, and even riding in a three-person submarine – the “Necker Nymph”. The rooms are all equipped with Wii consoles, iPod stereos, and surround sound systems (although many people do not even turn their televisions on). One could even have cold sushi delivered in a swimming pool via canoe. The possibilities are endless. Necker Island is a hot destination for celebrities since it is such a private location. The island is owned by Richard Branson, founder of the Virgin brand. He had the resort built as a place of retreat, luxury, and relaxation. Luxurious does not even begin to describe the serenity of Necker Island resort. For more information visit www.virginlimitededition.com/en/vle. A new luxury item is coming to the market - one that helps to maintain health and weight. It’s called the HAPI Fork and it will be available in late 2013 marked at $99. It’s an electronic fork that monitors eating habits. Gone are the days of wondering whether you’re eating too fast or too slowly. This luxurious item takes all the guesswork out of the equation. The fork is equipped with indicator lights which provide alerts when you are eating too fast. Eating too fast can contribute to bad digestion and poor weight control, and the HAPI Fork aims to prevent and help both of these things. The tool measures how long it takes to eat a meal, and the amount of “fork servings” eating per minute. It also comes with a HAPILABS application which includes a coaching program to monitor and help eating behavior which is interactive online. The device uploads your information via USB to the online dashboard, and from there you can track your results. The HAPI Fork vibrates in your mouth when you are eating too fast, while simultaneously tracking every time it touches your lips. Would you purchase this luxury item? For more information about the HAPI Fork visit www.hapilabs.com. 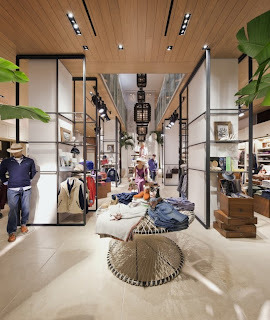 Tommy Bahama has launched a new store in New York City on Fifth Avenue and 45th street. 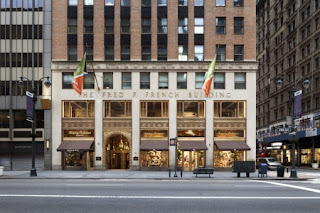 Its exquisite charm and design is what will bring in the customers, lured in by an oasis in the middle of the busy streets of Manhattan. Customers are able to experience 13,000 square feet of paradise, with every aspect of design carefully selected and placed. Consisting of 3 levels, each corner, light fixture, and ceiling fan is designed to imitate an ocean-side setting. The decorations consist of Floridian palm trees, driftwood, and seashell sculptures. There is tropical music playing, and there are light fans blowing an ocean breeze over customers. The limestone floors complete the marine feeling all the way around. Adrienne Parks, the visual manager for the store says, “We want to create an experience that customers will remember and tell their friends about”. 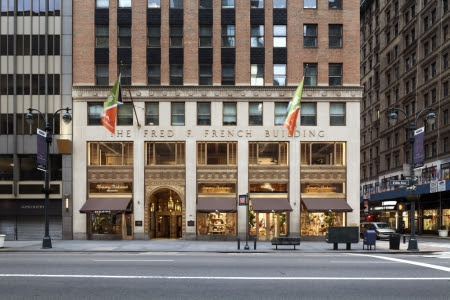 This seems like it will definitely be the case, as the store is complete with not only shopping areas and dressing rooms, but a stunningly beautiful bar. 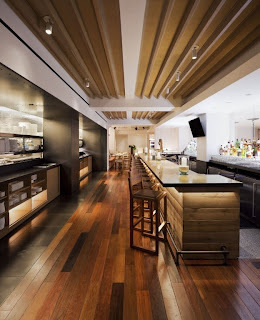 It is called the Marlin Bar and is made of oak wine barrels. In fact, every decoration and fixture in the store is either custom made or a “found” object. If it was found, there is a tag attached to it giving a short history of where the item came from. To say the least, the design and arrangement of the store is absolutely dazzling. Each of the three stories is a piece of expertly arranged art. For more information visit www.tommybahama.com. (photos via vmsd.com).